21st June: every year, on this day, I feel sad and excited at the same time. Excited because summer truly begins, and sad because from now on days start getting shorter and shorter. Apart from that, I’ve always wanted to make a long, tough and unforgettable ride on “the longest day of the year”, possibly starting right from home. 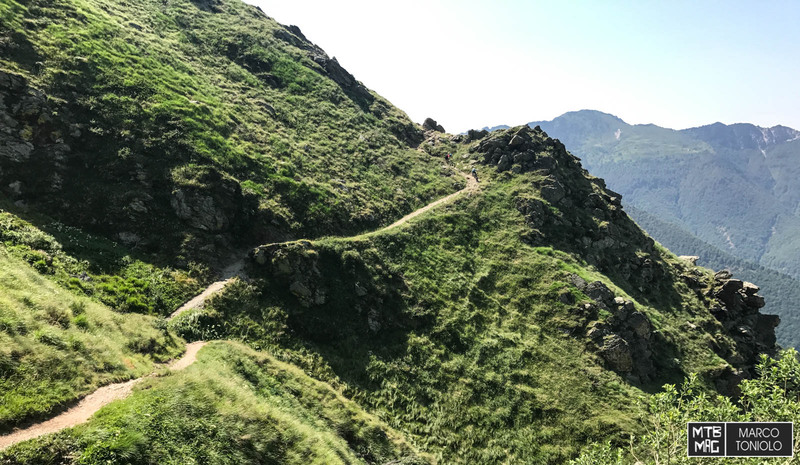 It’s not a new trail, but one which links the most beautiful trails near Lugano, Switzerland, ending with a final dive into the lake. Together with my good friend Andrea Chiesa, the developer of the Uptimizer dropper post, we decided to go and invite another fertile mind, Tomas Stoll, the creator of the Stoll T1. 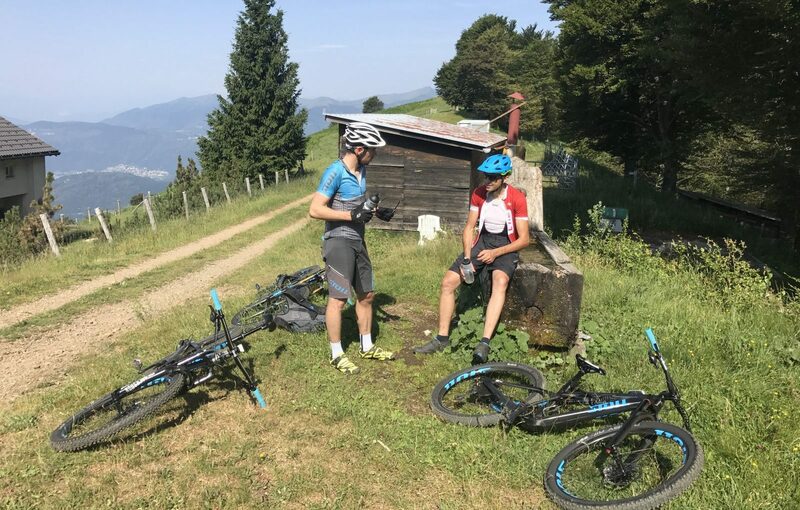 As you can imagine, we all rode the Stoll T1 equipped with the Uptimizer, and I could not but give my contribution to this team work, with this report on MTB Mag. Ready at 8 AM, down to the city, and then a long climb to Capanna Pairolo. 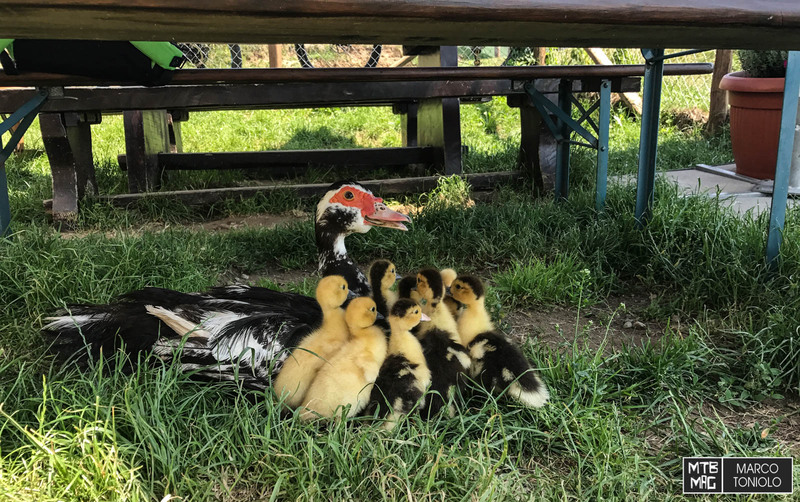 This is how our day starts, on the shady side of Valcolla, to escape the heat of these days. Today the forecast says up to 35° Celsius, fortunately there’s plenty of water along the trail, which actually comes from a line connecting all the water spots. 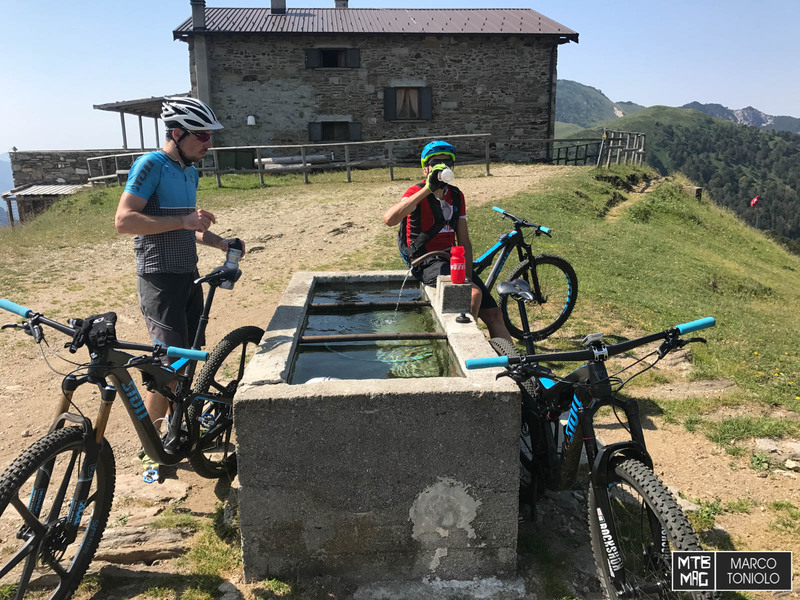 After 1200 vertical meters, a first break at Pairolo. 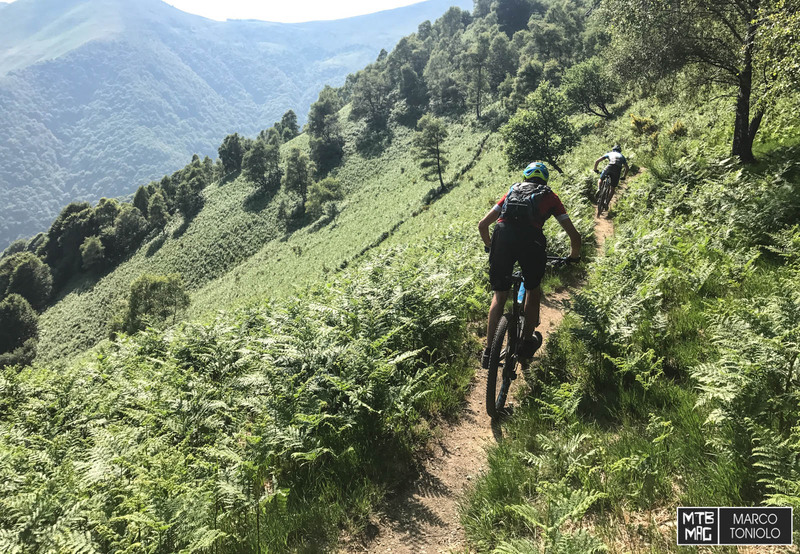 In the picture you see the last off-road bit of the morning, after, it follows a singletrack of approximately 15km which runs around the Valcolla passing through San Lucio and Piandanazzo. You can ride it all the way, provided you’re fit enough to pedal on technical climbs. You can enjoy views of Lake Como in the first part and then on to Lake Lugano. The ground is pretty dry and slippery due to the heat and it requires one to be careful more than usual. Let’s talk about the bikes: three Stoll T1 with 130/140mm of travel, equipped with 2.35” Schwalbe Rock Razor tires at the rear and 2.35” Nobby Nic (Andrea and Thomas) or Hans Dampf (me) at the front. Thomas uses Bike Ahead 6-spoked wheels which we talked about here, while the other components are the same on all bikes. I talked about the tires because, setting a relatively low pressure, it is possible to have good grip even in these conditions. San Lucio and its typical church on the Italian/Swiss border. At San Lucio we could not miss a stop at this refreshing fountain. It is really hot here, even at 1500 meters. The San Lucio – Piandanazzo traverse is a classic of this area. I know every bit of it, and so does Andrea, since we ride it nearly all year round. One of the hardest parts. It’s not clear from the picture, but there’s a rock in the middle of the line right where the track gets more exposed. The traverse ends at Piandanazzo, where the fantastic descent to Corticiasca begins. You cannot help but love it, because it’s fast but never predictable. 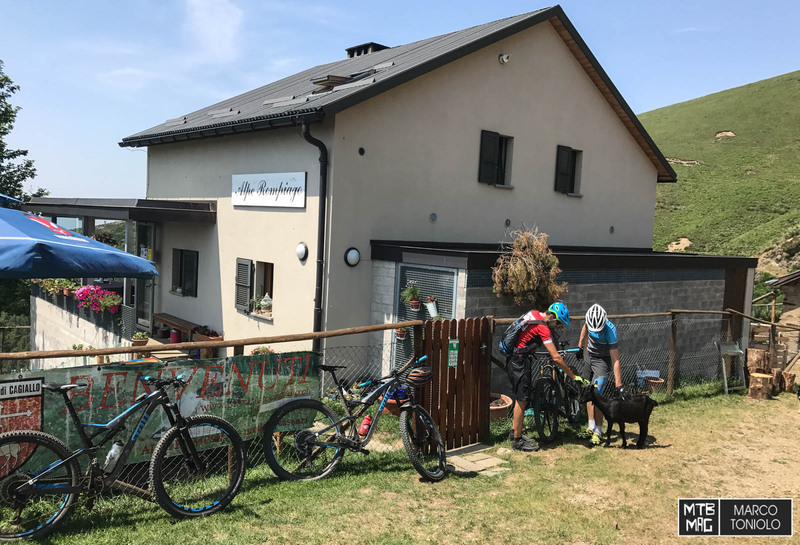 It’s now lunch time and we’re hungry, so we stop at Rompiago farm house in the middle of the climb to Crocione. Here there are 160 grazing goats, which are milked by hand by the owner and his wife. Goats and other animals are all seeking shade, given the temperature. We order pasta and the classic Ticino mandarine gazzosa. 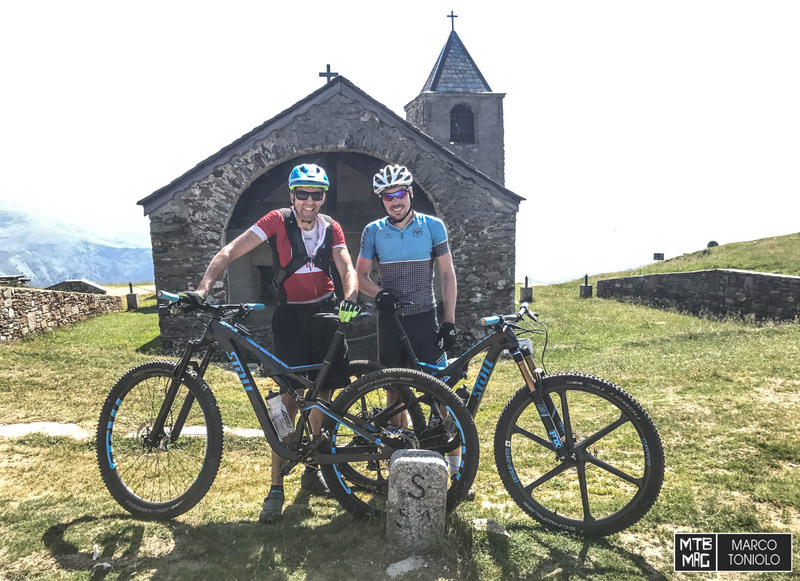 To get on the bike, uphill and on such a hot day is not easy, but after a couple of turns we are already at Crocione, the most panoramic spot of the trail. I forgot to mention prior, but this trail runs along marked and official tracks. The main one is the 66, with some variations to get to the most beautiful trails (see the gps track at the end of the article). Riding down from Crocione, Thomas gets a flat tire. The classic wide rim (28mm inner channel) flat, one cut between the knobs and one on the sidewall. We fix it with two rubber plugs, but our Swiss-German friend is not too happy to get soaked in sweat re-inflating the tire under the sun. 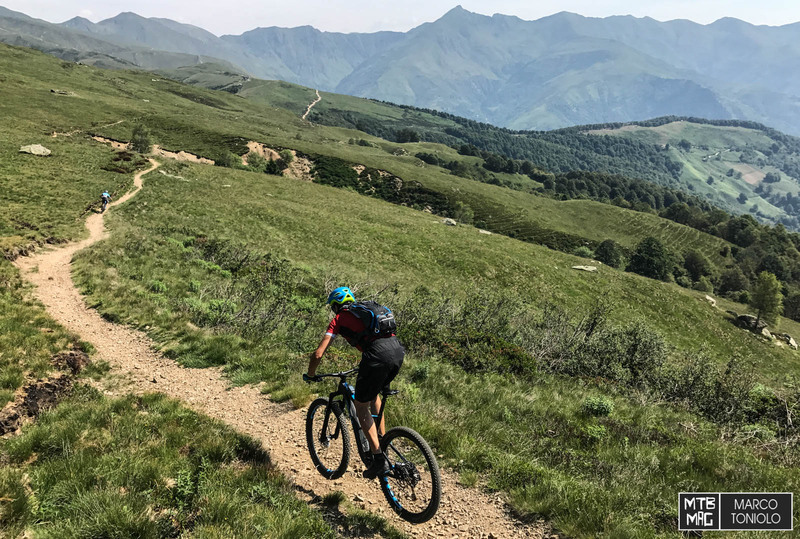 From Gola di Lago we decide not to descend directly to Camignolo following the 66 track, but instead to go up to Condra, to ride the beautiful trails which get almost to Tesserete, and then to go downhill to Vedaggio valley. The valley floor bike lane is on fire: it’s 2.30PM and it’s incredibly hot. We are at 350 m of altitude and the only relief is fountain close to the Tamaro gondola. “Stealing 1000 vertical meters!”. This is Andrea’s objection, the vertical meters fanatic, but as I give him a free ticket offered by the lift company, he stops protesting. The price includes the sauna inside the cabins, heated by the sun. 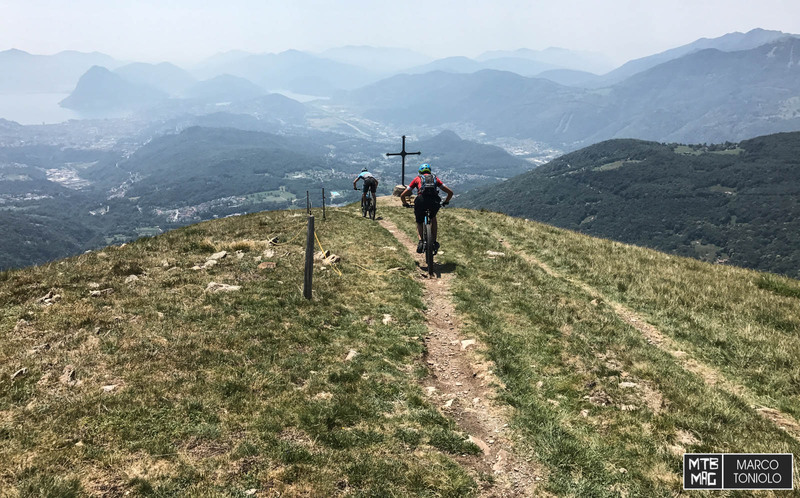 The upper station is at 1500m of height, so the air is cooler but not enough not to destroy us on the steep climb to the Capanna Tamaro: 350 vertical meters in the sun, steep, on harsh ground with zero grip. I start to see mirages so I stop with Andrea in the only tunnel. Despite sweating like hell, I start to feel cold. I need an energy bar and a gel to rise up again. 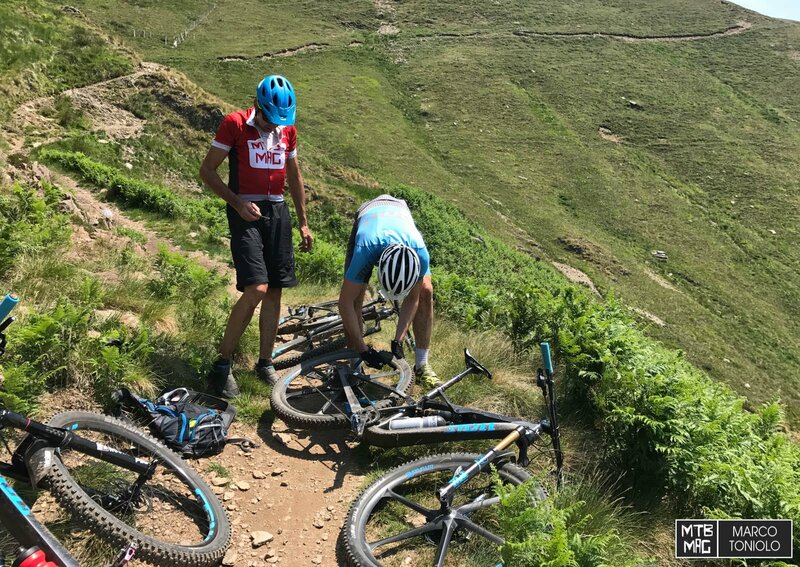 It is essential to feel “fresh” when you start the Tamaro descent, because it is really tough and exposed in its first part. 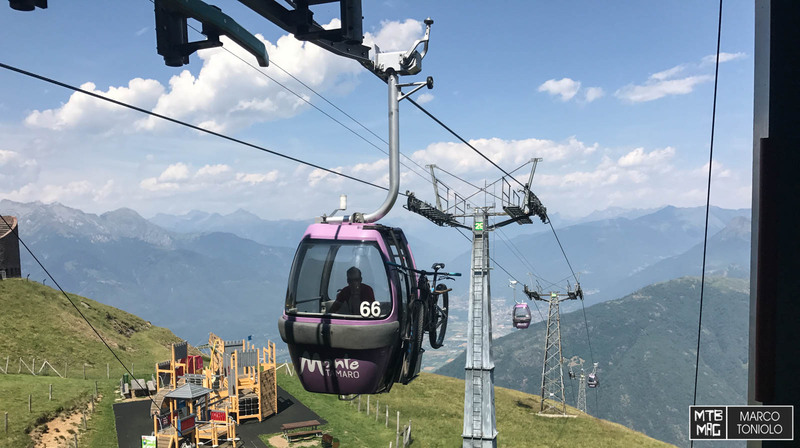 Furthermore, today there’s no one around, and we have already done 2,300 vertical meters with our legs, not counting the cable car section, of course. We have an apple pie and a coke at the Capanna to regain some energy. Past the exposed traverse, we can fully enjoy the rest of the trail, and we know it’s all downhill to the lake. Unfortunately Thomas gets another flat, in the same manner. We find out that the carbon rims are too sharp, and it is easy to cut the tire, especially on such a hard terrain as the Tamaro. 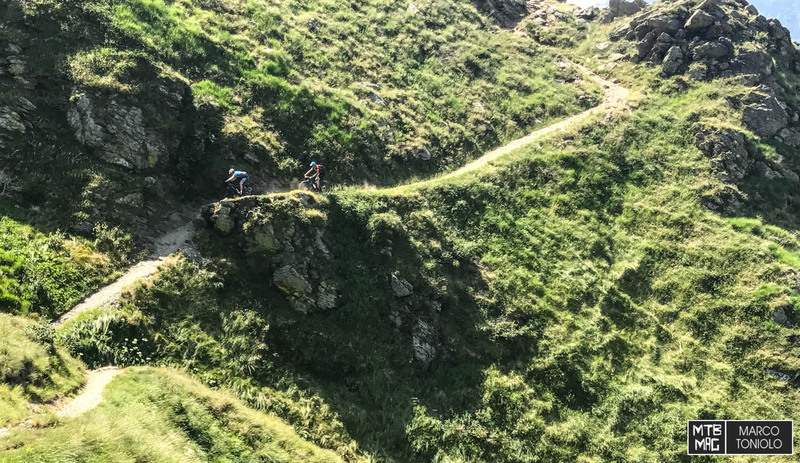 Here you can see the beginning of the most beautiful part of the trail in terms of line and difficulty: if you can keep the speed high enough, you’ll never need to put a foot down, and get to enjoy fun and satisfying sections. Otherwise you’ll need to push. But if you’ve got to this point, you must be able to enjoy it. The tracks go on towards the lake, we catch the bike lane along the Vedeggio only 2km away from the beach, and then have a well deserved swim in the lake. Even if it may look like Andrea and Thomas are going to strip naked, I can assure you they went swimming in their shorts! Total difference of height: 3,300 meters (1,000 with the cable car). Km: 93. 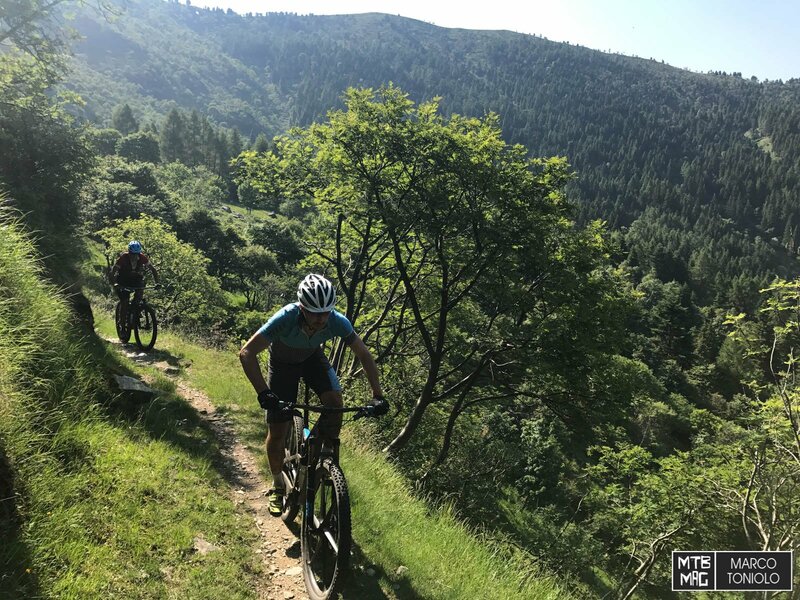 If the difference in height seems “little”, consider that the tour develops almost completely along singletrack and therefore it is more demanding than usual.